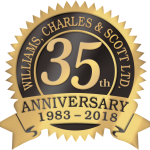 Birthday Loyalty Program • Williams, Charles, & Scott LTD. Please complete the short form below so we can enroll you in WCS’ Birthday Loyalty Program! William, Charles & Scott LTD.